The Siriraj Medical Museums in Siriraj Hospital, Bangkok display exhibits relating to pathology, forensic medicine, parasitology, anatomy and the history of medicine in Thailand. 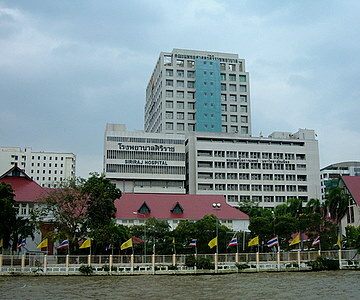 Siriraj Hospital is the first public hospital in Thailand established by King Rama V in 1886. It was named after one of his sons who died of dysentery at the age of two. The Faculty of Medicine here, set up in 1890, is also the oldest medical school in Thailand. Please see map to the museums. Let's start our tour of the Siriraj Medical Museums with the Ellis Pathological Museum named in honor of Professor A G Ellis, the first pathologist in Thailand who worked in the Pathology Department in 1921 and stayed on as Director of Siriraj until 1938. The babies preserved here are either stillborn or dead shortly after birth. There're dissected sections of babies, Siamese twins showing their joined organs and babies born with one eye. Some have external or internal deformations arising from various diseases or with organs protruding outside the body. Specimens of preserved organs used for pathological tests are displayed with organs infected by various diseases. Medical students were scribbling away in their books, though not all visitors were as enthusiastic. One visibly shaken woman visitor was seen sitting out the tour. Our next stop in the tour of Siriraj Medical Museums was the Songkran Niyomsane Forensic Medicine Museum. It was named after Professor Dr Songkran Niyomsane, a pioneer in forensic medicine who started the museum. The latest addition to the museum records the efforts by Siriraj Hospital during the December 2004 tsunami, when pathology teams assisted in the disaster victim identification. The scenes are simply gruesome. The rest of the displays cover skulls, bones, damaged organs and photographs of murder and accident cases used in investigations, including the preserved bodies of a couple of rapists/murderers! I gather that the founder, Dr Songkran's skeleton is also on display in the museum, though I couldn't quite identify it! The Ouay Ketusingh Museum of History of Thai Medicine started by Professor Ouay Ketusingh, who headed the Departments of Physiology and Phamacology, was started in 1979. The traditional Thai medicine shop display was a pleasant relief. Also featured are the traditional practice of child delivery by village midwives and the quaint practice of getting the new mother to sleep by the fire for quick recovery. In the Parasitology Museum started in 1970 by Dr Vichit Chaiyaporn, Department of Parasitology, you'll be exposed to every conceivable form of parasite or worm infecting every movable form of edible life. Lungworms, pinworms, roundworms, tapeworms, whipworms infecting livestock, fish, crustaceans, vegetables and viruses causing food poisoning are identified here. So are the mosquitoes that cause Elephantiasis, an enlargement of the leg and the scrotum. If it's not what you eat, then pay heed to the venomous snakes, spiders, scorpions, centipedes and tarantulas. Congdon Anatomical Museum was started in 1927 by Dr Edgar D Congdon, Professor of Anatomy and father of modern Anatomy in Thailand. Row after row of showcases display skeletons, skulls, organs, dissected sections, preserved nervous, muscular, arterial and venous systems. Being the oldest museum, the creaking floorboards added to the creepy air about the place. By the time we reached the last of the Siriraj Medical Museums, the Sood Sangvichien Prehistoric Museum & Laboratory it was closed for lunch. This was just as well, as we've had an overdose of corpses by then. As it turned out this museum, started in 1972 by Professor Dr Sood Sangvichien, Dean of the Faculty of Medicine, dealt with evolution! For those keen on anatomy, pathology, forensic medicine, these medical museums would probably be a wealth of information. These museums were in fact set up as resource centres for medical students. If you can be indifferent to preserved corpses, dissected sections, organs damaged by disease or violence, you'll probably be able to cope with the tour. If you can't, we strongly suggest you skip the Siriraj Medical Museums and go straight for lunch. The six museums are located in two buildings. A convenient way to get there is by Chao Phraya River boat to the N11 Railway Station Pier (Rodfai Pier). Though you can get there by landing at the N10 Wang Lang Pier too, the Railway Station Pier has a shorter and more direct route to the museums to avoid getting lost within the hospital complex. From the Railway Station Pier walk straight along Rodfai Road to gate no. 5 which is the furthest from the pier. Turn left into Siriraj Hospital and Block 28 is on your left just 50m away. Visit the museums in this block first. Siriraj Medical Museums are open from Monday – Friday between 0900 – 1600 hours. Admission fee is 40 baht. Tel: 02 – 419 –7000. No photographs please.